Owners of Android phones and (if you’re out there) Android tablets have had a rough time of it as far as music apps. A lackluster market combined with inconsistent-to-awful audio performance have kept the bulk of mobile development on iOS. But if you do have an Android phone or tablet, we’ve got a beautiful app you can enjoy. And if you’re lucky enough to have one of a handful of specific Nexus devices, you can use the very-powerful SPC Sketchpad with low-latency support. In fact, these two apps represent a microcosm of what’s possible. Creative apps that aren’t latency-dependent can run on a wide variety of devices. And the apps that do need better performance can at last run perfectly nicely on a Nexus that supports low latency operation. The problem remains that the latter category is way too small a target audience. Let’s talk about the app for everyone first. SphereTones is a beautiful, animated artwork, a “visual instrument” that is its developers say were inspired by perpetual-motion machines. It’s great fun to use, and it runs on phones, too. I love the crisp black-on-white graphics. 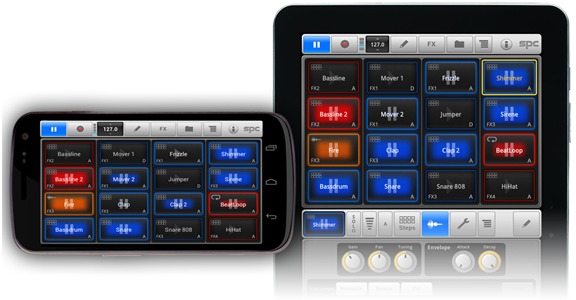 It’s got a lot in common with other sound toys, including Web apps and iOS creations, but it’s very nicely executed. It’s all built in the cross-platform, free software library OpenFrameworks. These sorts of libraries – and the popularity of portable code generally – mean that musicians and artists working with mobile platforms are creating works of art that they can easily move to new platforms as they become available. If you do have one of those three gadgets, though, you should try out mikrosonic’s SPC – Music Sketchpad 2 right now. SPC doesn’t feel like a consolation prize for iOS-jealous Android die-hards. It’s a brilliant all-in-one workstation on any platform, with a clean interface and balanced features. You get multitrack recording, a sampler, step sequencing, effects, looped recording, and more. And now, the whole package supports low latency operation for smoother performance on supported devices. It’s just the “on supported devices” that isn’t progressing very quickly. I’ll talk more about this situation soon; we have an updated version of libpd that will take advantage of the low latency profile. But I think it’s worth complaining now: Google made the Nexus 4 and Nexus 10 a part of their pitch to developers, but right now, it’s hard to even purchase those devices. At the same time, if Google and their OEMs can ship devices with this support, they could begin to have a fighting chance to attract the sort of creative apps that have fed the appeal of iOS. That said, this is a perfect opportunity to find out if you have an app – and find out, in the real world, if this performance makes a difference to you.